Need a reliable wireless connection for your laptop or desktop? 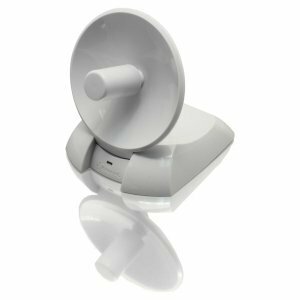 The HWDN3 USB Wireless 300N Dish Network Adapter, connects your Mac or Windows system to a wireless network at up to 300Mbps. 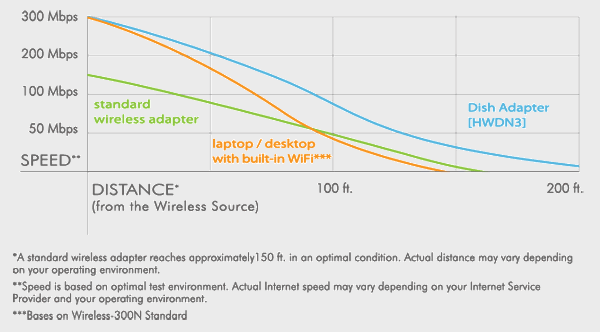 Most laptops and desktops with built-in adapters have limited Wi-Fi coverage due to a fixed internal antenna and interference from other laptop/desktop components, resulting in an unstable connection speed. This causes online activities such as surfing, video chatting, streaming, and gaming to constantly lag. The HWDN3 is an external Wi-Fi adapter engineered with a high performance dish antenna to obtain the best Wi-Fi signal for your laptop or desktop. 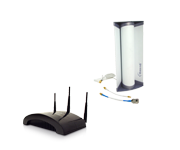 The dish shaped antenna isolates the signal, deflects interference, and directs the Wi-Fi Signal to the source, allowing your laptop or desktop to reach the wireless source from further away than most wireless adapters on the market. The 5ft USB cable gives you the ultimate flexibility to place the adapter away from Wi-Fi interference. 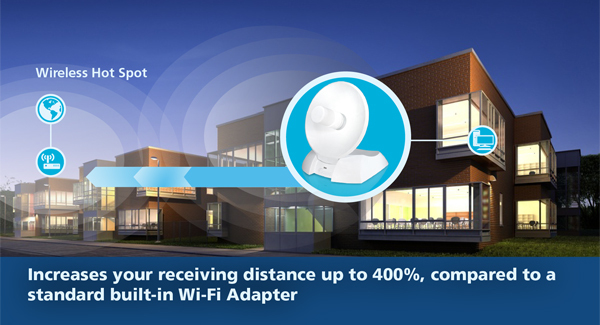 Simply run the included setup wizard, plug in the dish adapter, find your network and connect! 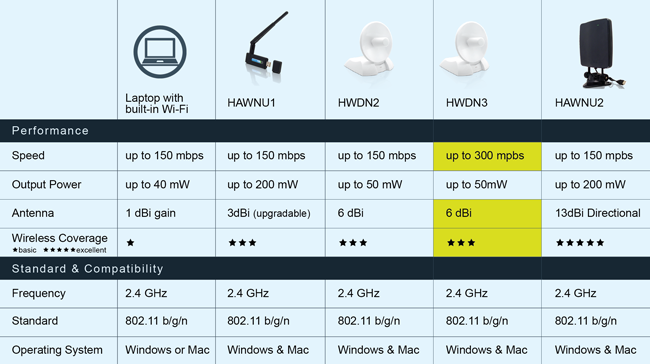 The HWDN3 can be operated in any Wireless-B,G,N Network, to provide better connections at greater distances. The innovative internal dish design pulls in signal from further away, while the dual antenna feed maximizes wireless strength and speed. 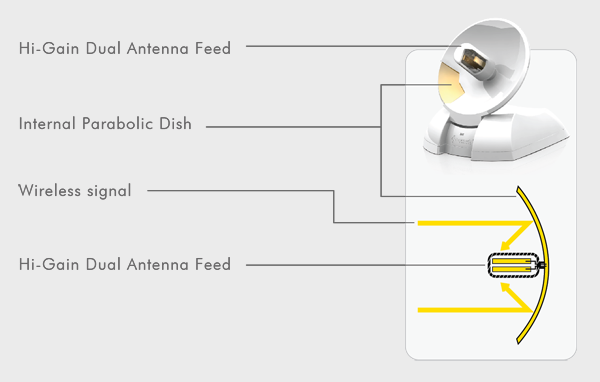 The HWDN3's Dish reflects the incoming signal and concentrates it on the Dual Antenna to boost your wireless performance. Use the chart below to see which USB adapter is right for you. 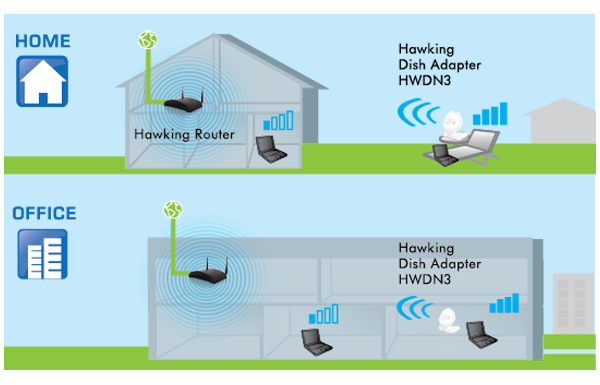 The HWDN3 Wireless-N USB adapter provides a greater wireless coverages than most standard built-in Wireless solution, while offers connection speeds of up to 300mbps.